Celebrating its 30th anniversary, the Alliance Française French Film Festival runs from March 5 to April 10 in Sydney, with other cities running more or less in tandem with those dates. Delivering a program bursting with 54 features, it is being screened across the city at various locations, plus smaller selections exhibiting in Parramatta and Avoca Beach. The other state and territory capitals included in the Festival program are Adelaide, Brisbane, Canberra, Hobart, Melbourne and Perth. Screening schedules for these cities can be found here. The festival kicks off in high spirits with Pierre Salvadori’s screwball comedy, The Trouble With You, one of the biggest hits at the Cannes Film Festival last year. It stars Adèle Haenel as a wife who discovers that her deceased policeman husband was not the hero she thought he was and sets out to right his wrongs. Closing night is Michel Blanc’s Kiss & Tell, another comedy, that features a handful of stories around the central theme of deception in relationships and an all-star cast that includes Carole Bouquet, Charlotte Rampling, Jacques Dutronc, Jean-Paul Rouve, Blanc himself, and Karin Viard. With such a large repertoire of films to choose from, the program has grouped them under banners such as Paris Snapshots, Critically Acclaimed, Summertime, Lighten Up!, Danger Sphere and Across Borders, among others. Some of these categories contain a single title: A Modern Masterpiece features Jacques Audiard’s The Sisters Brothers, a gritty western that sits comfortably within the realm of the Coen brothers and Tarantino movies, and stars Jake Gyllenhaal, Joaquin Phoenix and John C. Reilly. A confronting film that follows a pair of hit-men brothers as they travel across 1850s California leaving a trail of violence in their wake, it is Audiard’s English-language debut. Another category containing a lone entry is A Timeless Masterpiece. 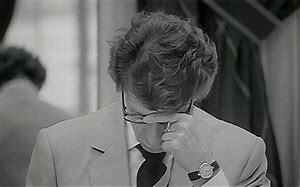 It’s a fitting title for Alain Renais’ restored version of Last Year At Marienbad, described by The Los Angeles Times as “… one of cinema’s glorious enigmas, endlessly compelling and intriguing.” Definitely not to be missed. Finally, France’s Favourite also refers to a single film, Gilles Lellouche’s Sink Or Swim, with a stellar cast including Mathieu Amalric, Jean-Hugues Anglade and Guillaume Canet. A comedy about a middle-aged group of men who form a synchronised-swimming team, it received a standing ovation at Cannes and was a massive hit at the French box office. Interestingly, a British version of the same story, Swimming With Men, is about to be released in Australia later this month. The Festival includes two documentaries on famous fashion designers, Celebration: Yves Saint Laurent and Jean Paul Gaultier: Freak & Chic, that are bound to be popular; as will the legendary Jean-Luc Godard’s latest film, The Image Book, an experimental, supremely original visual commentary on contemporary existence that was awarded a special Palme d’Or in Cannes. Other high-profile directors with new work included in the Festival are Olivier Assayas (Non-Fiction), Claire Denis (High Life), François Ozon (By The Grace Of God), Julie Bertuccelli (Claire Darling), Valeria Bruni Tedeschi (The Summer House), Denys Arcand (The Fall Of The American Empire) and Agnès Jaoui (Place Publique). Each of these filmmakers consistently provide thought-provoking, skilfully made movies and these recent titles promise to live up to their creators’ reputations. As the nights grow longer, the French Film Festival is perfectly timed for audiences to indulge their cinematic senses and make the most of one of the major film festivals of the year. There’s a host of films to select from, covering an array of different genres, so choisir rapidement! Full program details can be found here. STOP PRESS - as films are viewed comments will appear on this page. The Sisters Brothers is a wild ride through 19th century California that keeps you on the edge of your seat. Although it is a strange tragedy/comedy hybrid, it does offer a glimmer of hope. A redemption story about greed delivered with fine performances by a trio of American actors - Joaquin Phoenix, John C. Reilly and Jake Gyllenhaal - this is an interesting addition to French cinema, albeit in English. 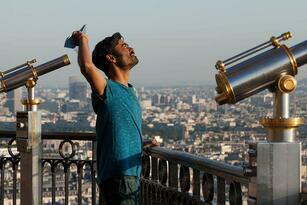 The Extraordinary Journey Of The Fakir is based on a novel by Romain Puertolas and stars the current Bollywood heartthrob - Dhanush - playing Aja, a young man who makes a living of sorts performing stunts on the streets of his Mumbai neighbourhood. When his mother dies, he moves to France, where he meets a young Franco-American girl called Marie (Erin Moriarty), outside an Ikea store. The story goes into overdrive as life takes a magical turn. The Image Book is an audio and visual collage drawing on images from a host of films and other sources. Directed and narrated by the legendary 87-year-old director, Jean-Luc Godard, it is a unique observation of our contemporary existence. It makes for a very interesting 84 minutes at the cinema and won a special Palme d'Or at Cannes this year. Celebration: Yves Saint Laurent is the long-awaited portrait of the legendary fashion designer as he prepares his final collection. It is aptly described as, 'a flawed film whose mere existence makes it worth viewing,' as much for the exquisite gowns on display, as the depiction of a man who was reclusive and at times seemed overwhelmed by all the fuss. Jean-Paul Gautier: Freak & Chic takes its audience on a journey into the 'eccentric universe' of the enfant terrible (although not so enfant any more) of the fashion industry. Gautier has a mischievous sense of humour and creates a fashion cabaret which includes his love of bears, creating extravagant costume and set designs that all come together - at the last minute - exhibiting his unique style for audiences at the famed Folies Bergère. The Fall Of The American Empire by the French-Canadian director, Denys Arcand, is enveloped in political satire and questions the extravagances of capitalism. A delivery driver, an ex-con and a call-girl team up to launder a pile of stolen cash. They have to battle the police, a criminal gang and their consciences. It is an entertaining attack on the global financial system and how easily it can be manipulated in the wrong hands. By The Grace Of God directed by François Ozon is a confronting tale of child abuse in the Catholic Church. The film is based on true accounts and concentrates on three men who attempt to 'lift the burden of silence'. They take on the weight and unrelenting power of the ecclesiastical body that destroyed their lives and denied their right to justice. This is a film that has grace and courage and resonates in today's climate of sexual abuse that is, by all accounts, unresolved. Girls Of The Sun focuses on a lawyer who became a freedom fighter when her husband was rounded up and shot, her son was taken hostage and she was captured and repeatedly raped along with many other Yazidi women. The film is incredibly emotional and pays respect to the female Kurdish army known as 'girls of the sun' who played a huge role in the fight against Daesh. AT WAR is a clarion call for justice in the work place. Vincent Lindon delivers a stirring performance as the leader of a 1,100-strong workforce facing the loss of their jobs in a regional factory. After making financial sacrifices, the workers learn that a shutdown is imminent, when their employers disregard their previous agreement. This is an important film directed by Stéphane Brizé that draws comparisons with Belgium's Dardennes brothers and Britain's Ken Loach. THE WORLD IS YOURS is a multi-cultural gangster movie described as a French version of a Tarantino film. Romain Gavras takes his audience on a roller-coaster ride with a gang of Parisian small-time drug dealers that escalates when they hit Benidorm. The characters are over the top and this hilarious, kitch, totally bizarre tale is full of black humour, violence and the weirdest characters dripping in designer garb. It was an audience hit at Cannes Director's Fortnight and is bound to be the same here in Australia. NON-FICTION immerses itself within an apprehensive French literary circle who question the fact that change is necessary for all to remain the same, only to discover that everything is not as it seems. A fine ensemble cast, featuring Juliette Binoche and Vincent Macaigne, deliver a robust, intellectual observation of life and love... in all their duplicity. Last Year At Marienbad directed by Alain Resnais, is a stunningly beautiful film about a man who returns to a Baroque hotel where he had an affair with a married woman the year before. Or did he? Set in the most opulent surroundings, this dreamlike film is either a reminiscence or a fantasy. Either way, it doesn't matter. It was the winner of the Golden Lion, at Venice, in 1961.